With the cost of living soaring, it is becoming more difficult to for some of us to survive the day by day let alone raise a family. And baby products are becoming more and more costly which makes it hard for parents and guardians to make ends meet. Hey! I have some good news to all the mummies and daddies, Lazada Malaysia is holding another Big Baby Fair where you can enjoy the best deals and prices for a wide assortment of baby products. Mark your calendars for Lazada's Big Baby Fair this coming 27 March to 2 April, 2017. Well, we should do our best to make the most of what we have, save and also keep a keen lookout for amazing deals. Stretch our ringgit and get more value added products. Tadah!!! Lazada Malaysia has a golden list of brands participating in this Big Baby Fair such as Mamypoko, Huggies, Nestle, Pediasure, Sweet Cherry, Anakku, S26 Gold Progress, Fisher-Price and many more. 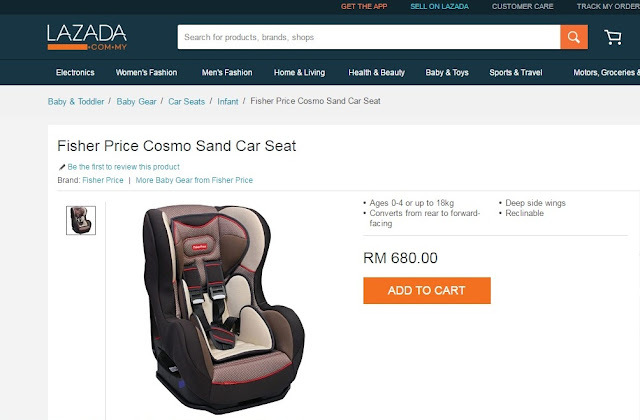 During Lazada Malaysia Big Baby Fair period not only will you be enjoying great discounts and flash sales from the brands above but you can also expect free shipping when you purchase selected products. Out of so many baby product brands in the market, my favourite brand of diapers for my future baby is Mamypoko and my choice of baby formula for my future baby baby is S26 Gold Progress. The one product from Lazada Malaysia that I would really like to get for my bestie new born baby girl is the Fisher Price Cosmo Sand Car Seat. Nothing beats safety and comfort for the baby when they are on the road and on long distance drive. If you love flash sales and ultra-low prices, make sure to keep your eyes glued to Lazada Malaysia throughout the Big Baby Fair. There will be up to 8 different amazing sales from different brands throughout the campaign! wow...shopping time!! ready to shop for my bb stuff. Great news for parents - they can save some money through sales. It is definitely hard work raising a family.